While I don’t consider myself a Hayao Miyazaki superfan, I’ve enjoyed his animation, but always felt at a distance to his work. With his final feature, The Wind Rises, the director loses the fantastical elements his career has been built upon (aside from a few dream sequences) and the result is an emotional connection I’ve rarely felt in the field of animation. Tracking the life passions of Jirō Horikoshi, a man best known for designing the Zero Fighter plane used in bombing Pearl Harbor, the film deals with obsession, guilt, and loss more effectively than any live-action film I’ve seen this year. Unfortunately, if you missed its one-week run in NY/LA this fall, you’ll have to wait until a home release to screen it with its native Japanese with subtitles, as Disney’s February release will be dubbed. – Jordan R.
There were a number of strong coming-of-age dramas this year (the aforementioned Something In The Air, Mud, purportedly The Spectacular Now, and even The Bling Ring), but none fused the creation of period details with a direct script as well as Ginger and Rosa. Director Sally Potter gets a career-best performance out of the always-improving Elle Fanning, and her use of costumes gives us all the backstory we need. The films move from one brilliantly observed moment to another (as when the two girls read magazines and shrink their jeans, of when Rosa takes Ginger to a club), and a great cast of adults add distinct supporting characters to the mix that amplify Ginger’s confusion. – Forrest C.
It’d be nice to discuss Lav Diaz’s latest without mentioning its runtime; four hours and ten minutes, which while reasonably short by his standards, will still likely scare off even a number of adventurous cinephiles. Yet the passage of time comes inevitable in actually engaging with it, as it’s intentionally most felt in the film’s strongest passage, in which its narrative strands stop at their seeming rigorous narrative and thematic development to simply depict life occurring at its own pace. Of course, considering the apocalypse it ultimately reaches, in which good and evil; a wrongfully torn-apart peasant family for the former, an existentially corrupted law student the latter, don’t see just ends, it comes easier to understand the film’s ultimate virtue; it’s lack of obsession with racing to its own ideological conclusions. – Ethan V.
I was rather fond of The Grandmaster’s theatrical form, finding both majesty and irrepressible beauty throughout the supposedly “dumbed-down” iteration of what was once a longer, knottier international item. The memory of an American release still relatively fresh in my mind, visiting Wong Kar-wai’s homeland edition proved a startling experience — not necessarily in viewing some exponential improvement on that which was already strong, but in encountering an entirely different narrative that befits a more resonant, true-to-the-auteur examination of time’s unstoppable force and its tragic shaping of romantic fates. (The year’s finest action sequences — the train-platform fight stands out, but Tony Leung‘s blank-faced “one more kick” is the stuff of dreams — certainly do no harm to my appreciation.) While one may wish to seek out the 130-minute cut in lieu of The Weinstein Company’s outing — I’ve felt it necessary to make a distinction between those two, after all — in either form does Wong provide a ravishing, formally radical work that refuses to be dismissed. – Nick N.
Harmony Korine‘s bizarre trip to Florida feels like the cinematic equivalent of taking drugs. Featuring dizzying cinematography from the lens of Benoît Debie, the DP of Gaspar Noe‘s Enter the Void and Irreversible, the film is less a traditional narrative and more a fever dream that encapsulates, similarly to The Wolf of Wall Street, the escapism inherent in the American Dream. But where Scorsese is more interested in the dangerous potential of unfettered freedom, Korine is all about embracing it. Spring Breakers is a hallucinatory journey into the vices of American culture without trying to tackle any one them too seriously, it’s just an odd amalgamation of a film. – Raffi A. In interviews for his comeback film, Passion, Brian De Palma stated his disdain for shooting on digital, its lack of ability to properly light beautiful women standing as the chief reason. The irony, of course, is that laptop screens and surveillance cameras were seemingly present at every point of the film, often capturing his leading ladies in bizarre, unflattering compositions that render them as concrete objects of the mise-en-scène. This is perhaps why adjectives that are all essentially variations on each other have been constantly thrown Passion’s way: “ridiculous,” “campy,” or, even more likely, “laughable” — though, to me, the right one might just be “brazen.” This isn’t just patting Mr. De Palma’s ever-present self-awareness on the back, but rather pointing out that, behind the smirk, there lies a genuine questioning of images themselves. – Ethan V.
Woody Allen‘s finest drama since Crimes and Misdemeanors was a dark, unsettling character study centered around one of the finest performances the director has ever brought to the screen. Months later, it is easy to forget how frantically unhinged Cate Blanchett‘s woman-on-the-verge of a lead actually is; rewatching at home may, if anything, make Blanchett, and the film itself, even stronger. 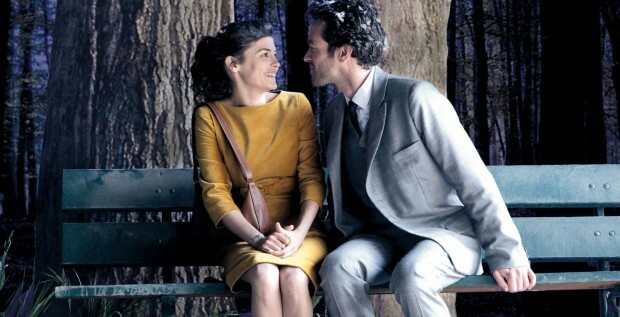 – Christopher S.
There is an absolute whimsy to Michel Gondry‘s Mood Indigo and it becomes infectious. If you’re familiar with Gondry’s previous works, you might understand what it means when I say this is his film without restraint. Every piece of the world seems to be alive with vivid color or animated in ways you wouldn’t expect. But the story is, at times, absurd.. I felt like I was actually Alice in Wonderland while watching Mood Indigo; at times I even wondered if I was dreaming. To experience this in a theater was transformative because I was absolutely engrossed. But that’s when things change, and the story becomes something else entirely. The whimsy of the world is like a shiny, freshly painted veneer that covers the darkness just underneath. In this world, there are also weapons, sickness, death, and depression. They aren’t nearly as fun to look at, and sometimes downright devastating against the backdrop of the whimsical world of Colin. When we are in love, everything seems right with the world. But the world keeps living, and there is darkness all around us as well. Mood Indigo, as an experience, is one I’ll never be able to shake—because of the whimsy, yes, but also because of the way that can become dulled without the color we are used to. – Bill G.
Let the Fire Burn tells the incendiary story of multiple bad decisions made by the City of Philadelphia which lead to the destruction of a densely populated neighborhood in attempt to “evict” the extremist African American liberation group MOVE. Told entirely in archival footage, Osder masterfully captures time and place; we know exactly what was known then, as muddy as the facts are. Framed by testimonials given before a commission investigating the day, the chips fall where they will. A powerful, thrilling, engaging and essential documentary, it’s fresh, speaking to us in the present tense from 1985. – John F.
This small miracle of a film concerns a young father in jail desperately trying to keep his family together. Director Michael Winterbottom gets raw, personal performances from everyone on screen, the film never coping to tearjerker moments or manipulative narrative turns. Of all of the films on this list, this is one you haven’t heard of, which is why it should be the one you go out and see. – Dan M.